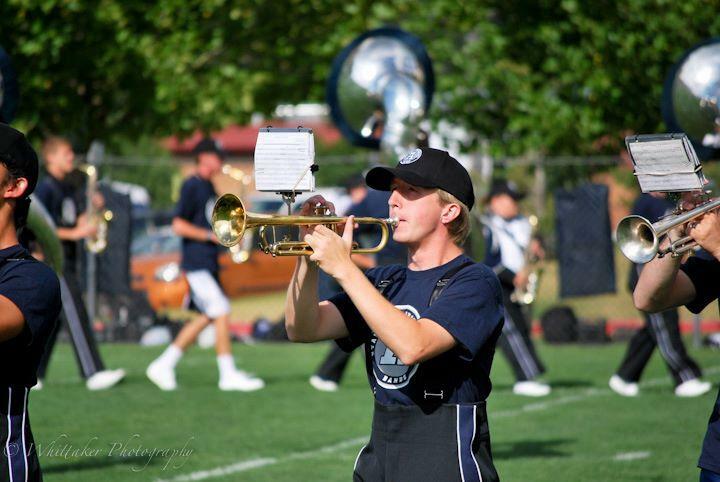 Eric S. Anderson is seen in this Facebook image playing the trumpet for the USU marching band. The incident prompted an outpouring of sympathy and tribute for the young student and musician. The U.S. flag was lowered to half-staff at the crest of Old Main Hill, and a bouquet of flowers was placed at the trunk of a tree near the site of the collision. Craig Jessop, dean of USU’s Caine College of the Arts, spoke to reporters Tuesday afternoon about the school’s plans to honor the student. A bouquet of flowers is seen at the base of a tree near the site of Monday's fatal collision of a cyclist and slackline. Jessop said Anderson was a member of multiple music ensembles on campus and a promising young artist. The Caine College scheduled a memorial service for students and faculty at the Performance Hall on the USU campus, where Anderson’s parents were expected to attend along with music professors and the marching band director. Monday's first responders included patrolmen from the Logan Police Department and Utah Highway Patrol who initiated first aid. “The student was treated at the scene and eventually taken to the hospital where he was later pronounced dead,” USU Police Chief Steve Mecham said.